October - what online stitching communities do you enjoy? In the beginning there were bulletin board and forums. I discovered cross stitch forums back in 2010 and enjoyed the chat on the Yuku boards for Mirabilia, San Man and Needlecraft Haven. I also joined the Round Robin board and took part in several of those projects. I noticed that many stitchers had links to their "blogs" in their signatures and started following a few of those. In 2011 I took the plunge and started a blog of my own. I had discovered that I liked to "hijack" threads, someone would say something and it would send me off at a tangent. Well, this is my tangent, I can discuss whatever I want! I had joined Facebook when I was pregnant with the Small Boy along with a number of women from a parenting forum. From there I discovered the stitching groups. My favourites are the Designer-specific groups where you can actually talk to the designer! How amazing is that? 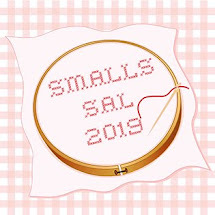 I also enjoy groups which organise themed SALs and I'm currently quite active on Stitch Maynia and Cross Stitch Finish Line. The new kid on the block is FlossTube or FlaaaaaaaaasTube as the Large Boy calls it! This is the collective name for stitching videos found on YouTube. I do enjoy listening to a stitcher chat about her projects and showing her stash (or his projects and stash in Coffee Stitcher's case!). For me, the drawbacks with both FB and FT are that you can't look back and find things easily. What was that lovely Hallowe'en project I saw? On a blog you use the labels or the search bar and there it is. I haven't really explored Instagram. I like the chat and the written word in addition to the photos. 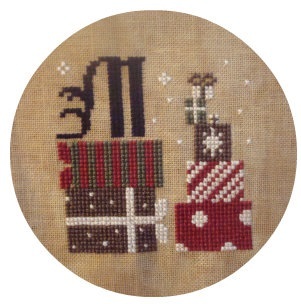 I like to know more about the stitcher and what s/he was thinking when they stitched the piece. People keep moaning that "blogs aren't as active as they were" and I did clear a load off my blog roll recently. But I also added a good few. If blogs aren't so active, why have I got 82 posts to read in my "New Followers" category alone? You have to find new people to follow, joining my blog hop is a great way to do that. Finally, did you see what I did there, led nicely into a plug for the Hallowe'en Trick or Treat Blog Hop! This will take place on the 31st October, of course, and all you have to do is post a picture of some spooky stitching along with a letter of the alphabet I will allocate you. To join in, just leave a comment and I'll add you to the list. We have a great group signed up already but the more the spookier! Lovely stitching Jo. I so agree with you on stitching forums. I really do miss some of the blogs I used to read. They have moved on to facebook or flosstube. I don't care for flosstube and facebook takes up alot of stitching time. Also, like you said, if you want to find something that someone is working on its almost impossible to find on facebook. Still love all your wips! Are you finishing the Christmas cubes as cubes, or will you do something else? Lovely pieces one and all. Wow Jo, I am always impressed with all the projects that you are stitching. I love seeing your variety of projects. Love your Primitive Hare piece and She Tends. Wonderful progress on your pieces! And ditto with the "not so active blogs" - I have gotten behind on my reading, and I need to catch up with over 300 posts! How inactive is that? I don't think there are less blogs now either, in fact I think 2 new blogs spring up for every old one that fizzles out (like a hydra but not so bitey) you just need to look out for them.. Clever segue into your blog hop, Jo, nicely done. I am with you, the number of blogs is probably increasing, it is just the participants who are changing - it is an ebb and flow of life. I now use Instagram and FB but they do not substitute for a good old yarn on my blog. She tends is looking very pretty - is it too separate pieces? I would love to participate in the halloween hop :) I think I have a witch or two I could post. Love you blog and I'm a lurker and love hopping from blog to blog. Lovely projects!! I have seen FT a few times but they are time consuming to watch. I cannot manage more than two social networking accounts so I am happy with blogging and Ravelry. 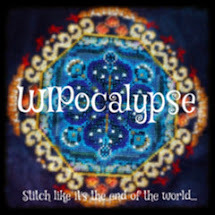 Great progress again on your WIPocalypse pieces - I'm very glad you started blogging when you did, because yours is really one of my favourite blogs to follow. I get what you're saying about following new blogs instead of complaining about the old one's getting inactive...only, I'm getting so attached to some people I'm really sad when they don't post anymore. And at the same time, I'm kind of glad I don't 'have' to read ten new posts every day! I'm strange, I know, I know. Great progress in your WIPS, I look forward to seeing the finished designs. I have many inactive followers, I hope they come back. I am always looking for new Bloggers to follow. Great post! I do so love to ramble on your blogspace LOL. Since I've only been stitching since '09, forums were already very much in full swing. I started out with the LJ community (which is still pleasant to read) before moving to blogger. Blogger is a bit harder to keep up with IMO. There are just so many neat people out there. Sometimes they disappear and that makes me sad, especially the geekier crafters. I follow cross stitching, knitting, crochet, sewing, "vintage", and a few homemaking because delicious recipes and pretty storage haha. I sometimes use FB and Twitter for stitchy stuff, but mostly it's just real life vomit. Floss Tube just hasn't gathered my interest whether crappy Internet or just not my thing, I dunno. Same for Instagram though I do love to take a billion pictures of everything. Side question: Has your Followers widget disappeared too? I use a lot of script blocking add-ons for my computer but I swear that widget was there when I posted for GG! Brilliant post Jo. 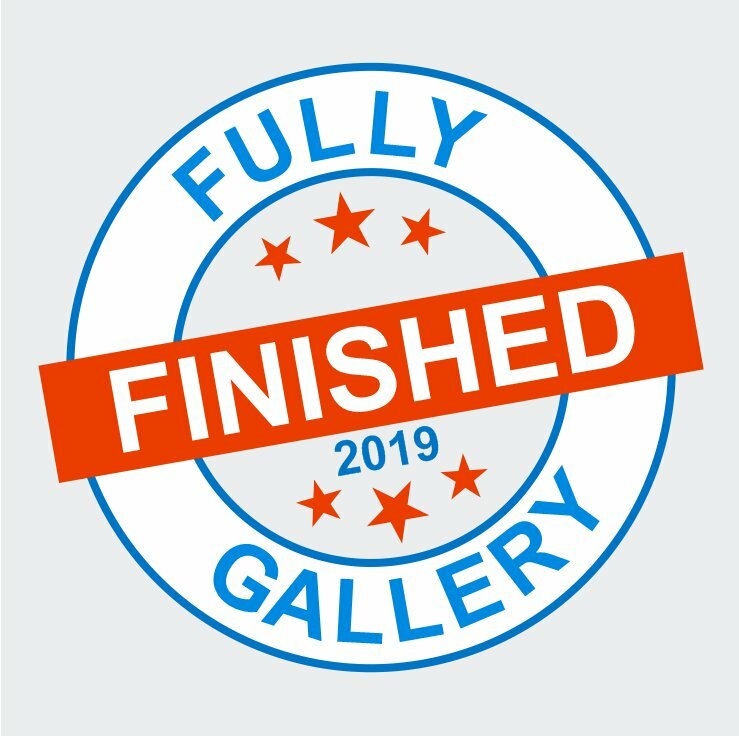 I must admit that I've considered giving up my blog as I just don't seem to have the enthusiasm to post like I used to and visit other blogs but I'd miss it if I did. I like the blogging community and have made many friends through it. I am on Instagram for quickness but I don't like it as much and FB isn't what it used to be when I first joined but the stitching groups are OK.
Great progress on your WIPs. 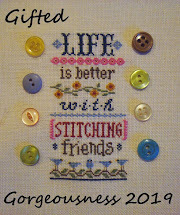 I'm with you on how blog are the best way to connect with people and their views on stitching. I have tried watching floss tube twice, didn't like it much. I'm a member of few closed grps on fb , however I don't comment much these days. You can now save posts on FB,that's how I keep record of patterns I like and want to stitch. Instagram is a good way to connect with non-English speaking stitchers as the picture is the focus there. Lovely stitching! The Shepherd's Bush piece is so sweet! Love your Shepherd's Bush project. I am itching to start something new and different, but trying to behave. I also never got round to pinterest, I prefer to talk and read about stitching. Some blogs I used to follow became inactive (sadly) but then and again I find new ones (I always planned to go through the bloglist on Stitch Mainia on FB, but it's soooo many) and my feed reader always has a few posts for me ;-) I used to be in a cross stitch forum as well, but after a hard breakup followed by a period of no stitching, I never got back to it O.o Maybe I should take another look at it. I don't do any social media stuff except blogging and blog reading, although I don't blog as often as I once did. I love to see your variety of lovely projects. Great projects, Jo. And great to read about the social media you use. Great stitching this month, Jo! Your stitching is very pretty. I find working on 32 count so difficult. She tends is so beautiful though.